JOHANNESBURG, Oct 1 2010 (IPS) - At dawn, Fatima Jardine-Millard straps a massive, German-engineered tank to her back and a tray of pastries to her waist, and prepares to cater to groggy motorists immobilised at a traffic light in Johannesburg’s chaotic daily commute. 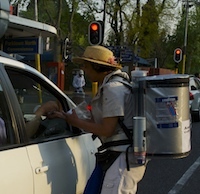 For about $1.50, a commuter waiting at this intersection in the working-class neighborhood of Parktown North, can get a cup of coffee dispensed hot from Jardine-Millard’s pre-filled tank. Another $1.50 gets a muffin or croissant from her tray. South Africans are accustomed to being offered newspapers at traffic lights, but Jardine-Millard says she is the only person she knows of who sells coffee in morning traffic. Remembering a vendor with a similar backpack selling wine at a concert, Jardine-Millard started selling coffee as a way to make money in between jobs. She opened Amamus Café and Bakery, which she uses as a station to brew the coffee and bake pastries, in addition to serving breakfast and lunch for the rest of the day. Jardine-Millard belongs to a growing breed of South African women who are willing to take risks to start and succeed in their own businesses. Traditionally, women have been held back from starting their own enterprises by factors including lack of education, child care responsibilities and limited assets, according to a country study by the Global Entrepreneurship Monitor (GEM) released last year. Men still dominate the industry and are about one and a half times more likely to start a business in South Africa than women, the report says. But despite the GEM report’s findings that businesswomen are less of a financial risk than men and their businesses have a lower rate of failure, banks continue to discriminate against women entrepreneurs when it comes to financing. Jardine-Millard said she reached out to banks to seek funding for her restaurant, only to be rebuffed. She ended up taking out a home improvement loan and used the money for the restaurant. Others have resorted to forming some sort of business partnership with their husbands. For Hilda Tod, owner of The Bedroom, an adult-oriented boutique in Durban’s upscale Umlanga Rocks suburb, working with her husband was key to her store’s opening. “Opening with [my husband’s] support was one of the best decisions I made,” said Tod, who opened The Bedroom in November 2007. Tod’s husband, an investor in a scrap yard, was also key to providing funding to open the shop. Like other entrepreneurs, Tod said she decided to forgo funding through banks to pay for her business’ opening expenses, mainly because she wanted to build a business free of bank debt. Nobuntu Webster built her marketing consultancy firm, Ayano Communications, on both savings from her previous job in marketing and funding from her husband. She avoided taking out loans because she felt they were unnecessary burdens on her nascent business. Being in an industry dominated by men, has allowed Tod to use gender to her advantage, she said. By marketing The Bedroom as a store for women and owned by women, Tod said her business stood apart from other comparable stores. For Webster, the challenges to running a business have centered around her age rather than being female. “I’ve had more issues being young and being taken seriously by my clients than being a woman,” the 28-year old Webster said. According to Kemp, female entrepreneurs generally fall into two categories: those who pretend to be in business, and those who are a serious about it. “Some are just playing at being a businesswoman, but it’s really just a hobby. Others are working all day and night on their businesses,” she said. The biggest challenge for a new entrepreneur, Kemp emphasised, is to decide which category they want to fall in.